Which is smaller, 22 or 6? 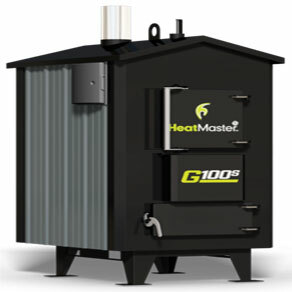 Firewood Manitoba is proud to be a dealer for HeatMaster Indoor and Outdoor Wood Furnaces Made in Manitoba for Manitoba Winters. Please click on REQUEST A QUOTE on the left and complete all information to submit a Quote Request. We will contact you as soon as we receive the request. Approx. Heating Space** 3,000 sq. ft.
Pricing Includes: 20 Year Warranty, Training and 24/7 Support from Firewood Manitoba. Please view Additional Information below or Click HERE to view our Info Sheet about HeatMaster Furnaces. HeatMaster indoor (yes, some models can be installed indoors) and outdoor wood furnaces are made in Manitoba (Winkler, MB to be exact), utilizing Manitoba workers, expertise and innovation. 1.) Environmentally friendly As a firewood supplier we pride ourselves on providing sustainable, carbon neutral heating alternative (firewood) to fossil fuels such as natural gas, heating oil or coal. Our OWF needed to do its part to keep smoke emissions low and heat output high to reduce our environmental footprint. 2.) Heat multiple buildings / components Quality outdoor wood furnaces aren’t cheap and if I was going to pay good money I wanted our furnace to heat our home, garage, shop and hot water efficiently and economically. I view the purchase cost of our OWF as prepaying a hydro or natural gas bill in advance. 3.) Look good Our yard is where we live, work and play and the OWF would be a part of that. We wanted something that worked hard and looked good while doing it and looked like it belonged in our yard, not an industrial afterthought. Little to no smoke was a must have to keep us and our neighbours healthy. 4.) Easy to use / efficient Even though we supply firewood for a living and have firewood handy, I didn’t want to have to be always filling our furnace when I could be spending time doing other things (like soaking in out wood fired hot tub). I also wanted a unit that made the most of the firewood it burnt. 5.) Local support As a rule I like to buy Canadian and even better buy from a Manitoba supplier. This supports our economy as well as having a local contact for any technical questions, parts, best practices etc. It also saves on shipping. 6.) User references It’s pretty easy nowadays to have a professional looking website and impressive marketing materials. Whether it’s a truck, a furnace, a dog or whatever I always like to talk to people that actually own / use one before I buy. The components of a HeatMaster heating solution. 1.) 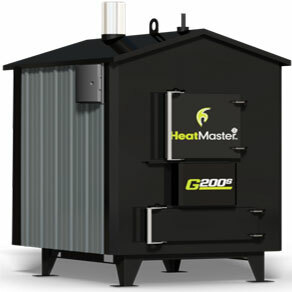 A HeatMaster wood furnace can tie into your home heating and hot water system easily and very effectively. A radiator can be installed in to the existing plenum of your furnace and a water to water heat exchanger can be used to heat your domestic hot water. 2.) To heat the home or structure, the outdoor furnace pumps hot water indoors via insulated underground pipes. Once the water enters the structure, it travels through the traditional heating systems, including radiant baseboard, forced air furnace or radiant floor system and then circulates back to the furnace. 3.) Heatmaster outdoor furnaces come with easy access rear doors and ball valves on the furnace outlets making plumbing and maintenance quick and easy. Insulated underground pipe enters the rear of the furnace through the floor and connects to the furnace outlets. The pump is installed on the supply outlet to push water to the building being heated. Electrical wiring and components are set up on the furnace for easy wiring and servicing. 4.) 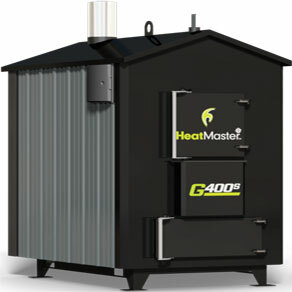 The HeatMaster system is perfect for garages, shops and other outbuildings. It will supply heat to an overhead forced air heating unit or in-floor heating allowing you to use the existing heating appliance as a backup.